Larry Alfred Smith was born July 16, 1948, in Hattiesburg, MS, to Arthur Vaughan Smith (deceased) and Doris Megehee Smith Barber. Larry died at home on February 11, 2019 of complications from a Parkinson’s plus syndrome, a disease he fought with courage and grace for several years. He was a life long resident of Jackson County except for the time of his birth and the seven years he spent in undergraduate and law school at the University of Mississippi. He lived in Pascagoula until after Hurricane Katrina when he and his wife moved to Moss Point, the town where his Smith ancestors had settled in the 1800’s. He was a longtime member of First Presbyterian Church in Pascagoula. He graduated from Pascagoula High School in 1966. At Ole Miss, he was a member of Sigma Nu Fraternity; President, School of Business; President, Law School Freshman Class of 1971; Treasurer, Law School Student Body, 1972; Vice President, Law School Student Body 1973; and a member of Omicron Delta Kappa. He served in the National Guard from 1970-1976. He was a member of the Mississippi Bar; The American Bar Association. He was President of the Jackson County Bar Association 1976-1977; President Young Lawyers Section 1975-1976. He served as President of the Jackson County Ole Miss Alumni Association. He was selected Outstanding Young Man of Pascagoula for 1980. He served as President of the Jackson County Boy’s Club. Further, he served as Chairman of the City of Pascagoula Election Commission. He was a member of the City of Pascagoula Strategic Plan Steering Committee and of the Pascagoula Economic Development Committee. 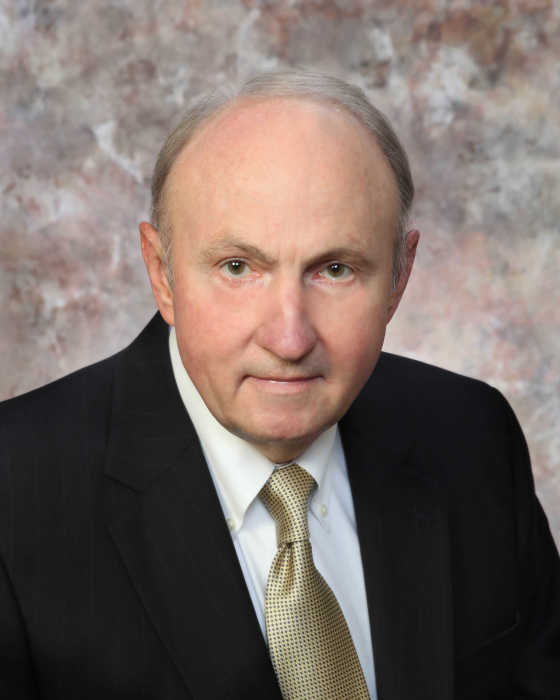 After graduation from law school in 1973, he was admitted to the bar and practiced law in Pascagoula for 40 years, most recently with the firm of Dogan, Wilkinson, Kinard, Smith, and Williams. He held Martindale-Hubbell’s AV rating, the highest rating, given by his peers. He practiced law and served as a member of the Board of Directors of First Federal Savings and Loan Association until his health failed. No matter what else Larry did in life, including being an avid Ole Miss fan, his greatest joy came from being Dad to his two daughters and Papa to his grandchildren. He is survived by his wife of 42 years, Patty Anderson Smith; his mother; his daughters and their spouses, Elizabeth Smith Brown (Jeremy) and Sarah Smith Lawrence (Daniel); his grandchildren, Grant, Carter, and Mary Alice McCullough, Sam, Ella, and Anden Lawrence, Cameron, Kaitlyn, and Jameson Brown. In addition, he is survived by his brothers Don Smith and Mike Smith (Rebecca) and his sister Laura Smith Riccardi (Sal). He is also survived by his aunt and uncle Carl and Sara Megehee, many nieces, nephews, cousins, and friends. The family is especially thankful to the friends who visited, sent cards, and prayed for him during his illness. Special thanks to Richard Lucas (MaryJon), his life-long best friend, and to his friend and law partner, Johnny Kinard (Judy), both of whom faithfully visited and supported him throughout his illness. The family is forever thankful to Larry’s patient and skilled caregivers: Sarah, Nadean, Dorothy, Mattie, and Alice. Special thanks to Jason Lauban who made it a priority to modify Larry’s home so he could live comfortably there. We are also forever grateful to his doctors: Doctors Terry Millette, William Evans, Ronald Rinker, Steve Fineburg, Rick Whitlock, and to Dr. Stevens and his staff in CRC in Singing River Hospital, Pascagoula. We thank the partners and staff of his law firm and the Board of Directors and officers of First Federal Savings and Loan Association for their many kindnesses throughout his illness. We also thank -Emcompass Home Healthcare and Hospice.